In case you’ve missed it (and if so, how?!) today is International Women’s Day. The event has gained huge amounts of attention. And this year we’ve noticed more brands acknowledging the occasion, with some using it as a hook to generate headlines. From Serena Williams to Barbie, we’ve created a round up of our favourite posts, campaigns and stunts. Mattel has launched a collection of Barbie dolls that represent real life role models, both past and present. The collection includes gymnastics champion Gabby Douglas, Polish journalist Martyna Wojciechowska and boxing champion Nicola Adams. It was created in response to global research showing that 86% of mothers worry about their daughters’ role models. Why we like it: this was a simple and well-executed idea. Mattel has worked hard to fight off the stereotypes surrounding Barbie being ‘pink’ and ‘girly’. These role model versions work well to help rid them of that reputation. We also love the thought that has gone into the role models they’ve chosen – especially NASA mathematician and physicist Katherine Johnson (whose work was featured in the film Hidden Figures). We’re all very familiar with the Mr Men and Little Miss series. But in a nod to International Women’s Day and British Science Week (which conveniently coincide), Egmont Publishing has introduced Little Miss Inventor (actually she was released a few months ago but re-released today). Described as “intelligent, ingenious and inventive”, the new addition to the Little Miss collection invents things for herself and her friends. Why we like it: This campaign struck a chord with us given our work with the Institution of Engineering and Technology. With only 11% of engineers in the UK being female, it’s important to highlight the wealth of opportunities for girls in engineering from a young age. Little Miss Inventor targets girls as young as three and shows them that engineering isn’t just a ‘job for the boys’. 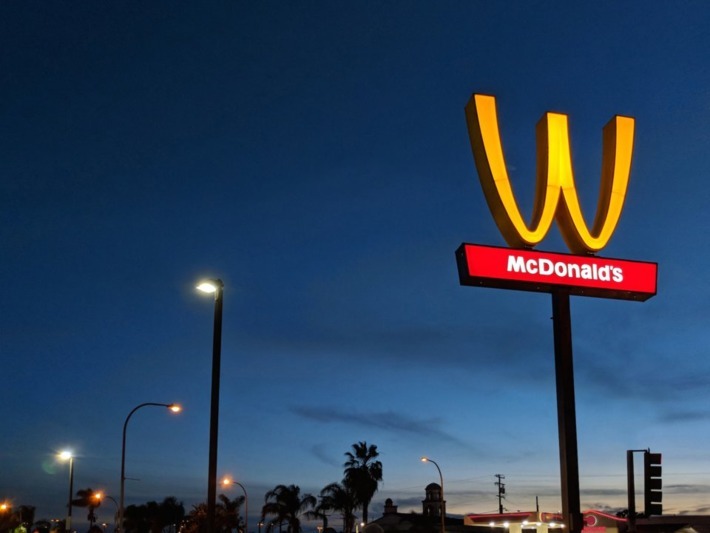 A Californian McDonald’s has seemingly turned its famous golden arches upside down, making the ‘M’ look like a ‘W’. Don’t worry though, this stunt was delivered via the power of Photoshop and social media. Why we like it: Well, we love those golden arches in general! But the simplicity of the up-ended logo to highlight its support of women makes us love Maccy D’s that little bit more. We’ve seen brands changing their logos for International Women’s Day (Johnnie to Jane Walker, The Colonel to Claudia), but this is by far the most simple yet effective one. A powerful one-minute video featuring clips of Serena Williams playing tennis accompanied by a voiceover discussing her experiences of being a woman. Why we like it: Serena can do no wrong for us. She’s ambitious, talented and embraces her femininity. Yet this powerful video reveals how even the strongest of women has had to conquer criticism for not being ‘womanly’ enough. Serena’s message is loud and clear here – there is no wrong way to be a woman. And lastly, of course, there’s our own rebrand for International Women’s Day, which has already been picked up by PRWeek. Long live Tin (Wo)Man!